Few examples illustrate so clearly the fragile relationship between painting and frame, and its vulnerability to changing tastes and fashions, as the activities in this area of the dealer Joseph Duveen; and we are reminded of his influence on the framing tendencies of collectors and museums by an article in the May 2017 edition of The Burlington Magazine (Karen Serres, ‘Duveen’s Italian framemaker, Ferruccio Vannoni’, pp. 366-74). 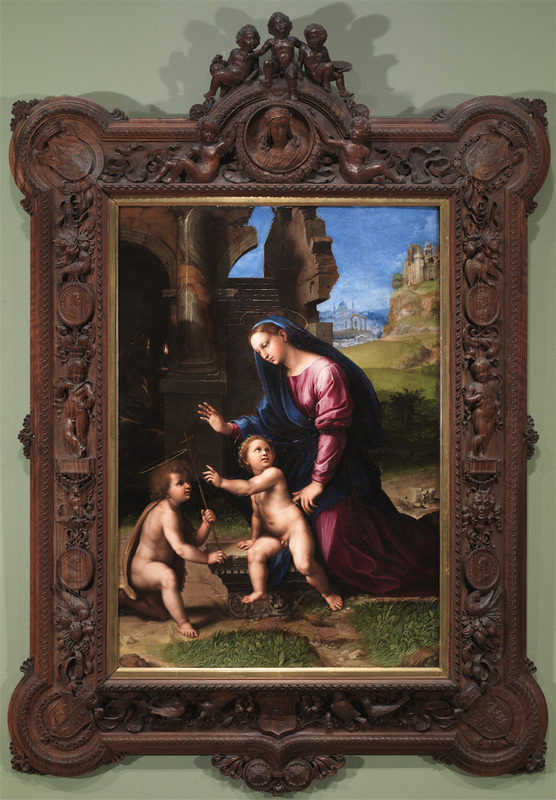 This is the third in a triptych of articles on Duveen; the first two were co-written by Nicholas Penny and Karen Serres: ‘Duveen and the decorators’ in 2007, and ‘Duveen’s French frames for British pictures’ in 2009 . The most recent article focuses mainly on a single carver and gilder – Ferruccio Vannoni, who died as recently as 1965, underlining the continuity of a craft which reaches back, via a chain of master and apprentice, into the 14th and 15th centuries. Vannoni trained at the Istituto di Belle Arti in Siena, and then worked for Giovacchino Corsi (fl.1866-1930), part of whose output consisted of replica frames decorated with both carved or moulded ornament, a line of work in which Vannoni was to specialize. The exhibition itself helped, of course, to promulgate and diffuse the style amongst collectors. In Italy the Risorgimento of the 19th century was allied with a similar increase in popularity there of the Renaissance style (which had never fallen completely out of fashion) as an expression of nationalistic unity; and Italy moreover possessed craftsmen who were trained – saturated – in all the various elements of the style, and in the techniques for their re-creation. Vannoni was evidently an extremely talented member of this body – a skillful designer, carver and gilder of replica Renaissance (and also Gothic) revival frames – and Karen Serres uses stockbook entries and letters from the Duveen archives to examine his rôle and prolific output in depth, from about 1925 when he started to produce frames for the firm . 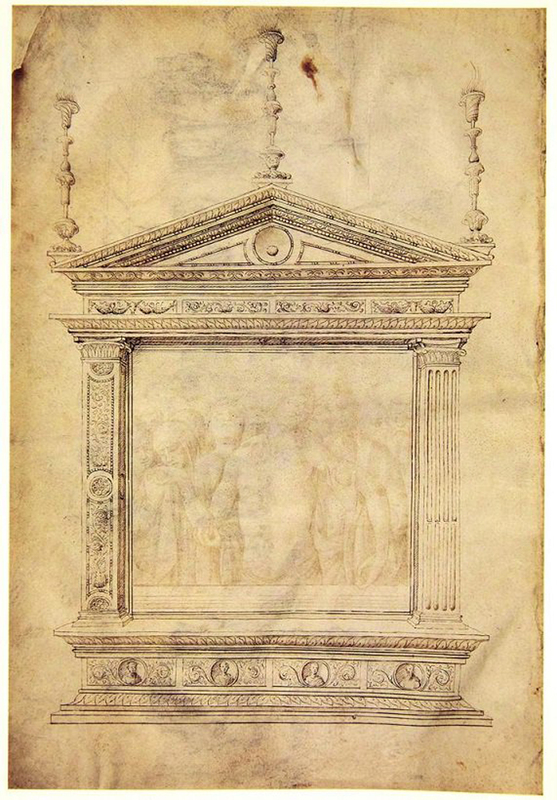 She also reproduces a couple of his drawings, of which one (above) provides two alternative forms of decoration for an aedicular frame on the two halves of the same structure. 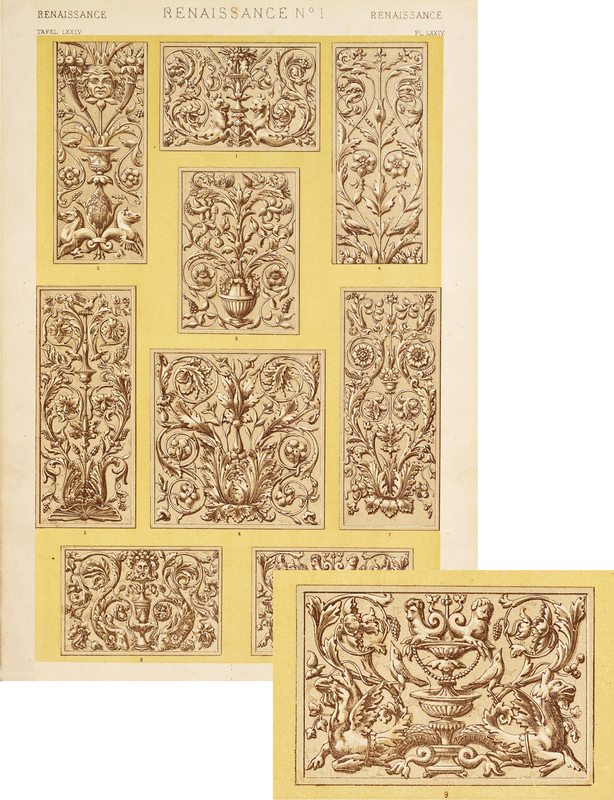 This is in the style – if not so finely drawn – of original 15th and 16th century designs, such as that by Bellini (above), demonstrating the historical continuity of this approach to structural variants and ornament. 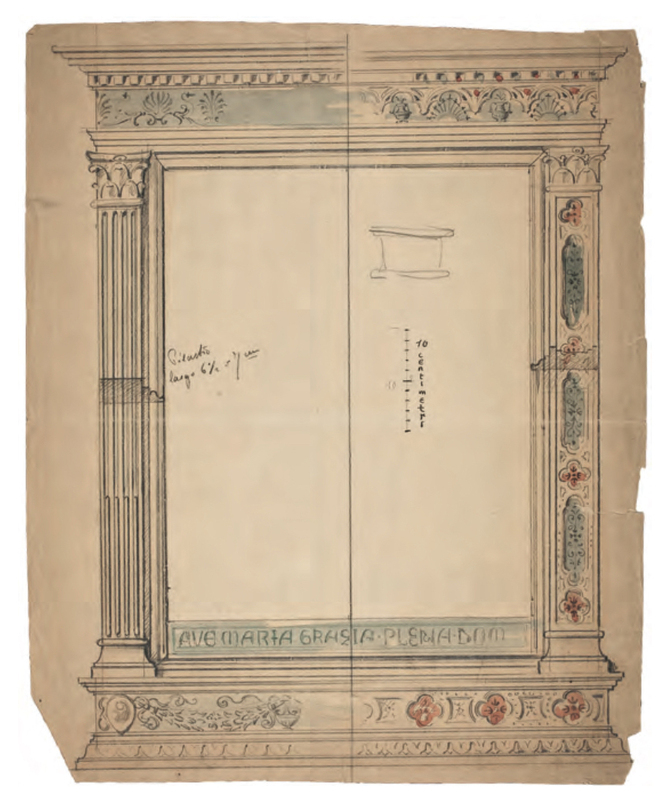 The second drawing published in the article shows the corner and profile of a cassetta with detailed coloured arabesques on the frieze. Both the earlier framemakers mentioned by Penny, Giusti and Barbetti, seem to have specialized in a similar style of extremely finely carved scrolling or vertebrate ornament, usually in stained and polished dark wood, often relieved against a gold ground. 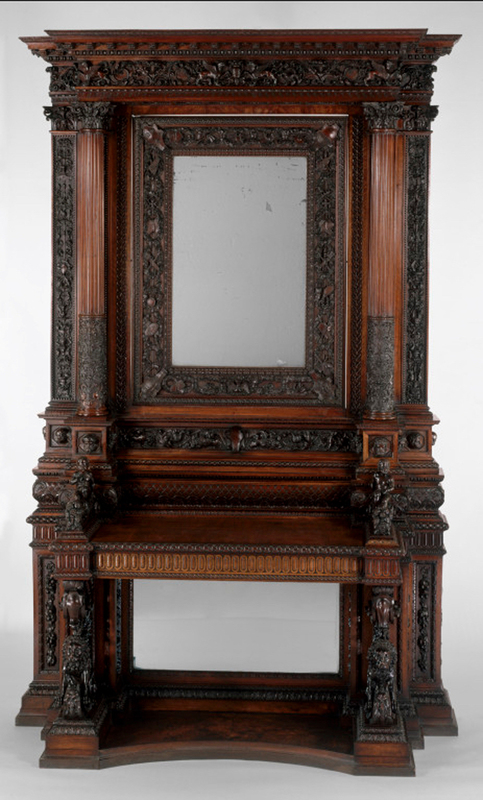 The example by Giusti, above, is exceptional – a virtuoso but anachronistic mid-19th century trophy frame, beautifully carved in walnut, which was commissioned by the owner for the ‘Kingston Lacy Raphael’ (see Christopher Rowell, ‘Notes on the revival of the Auricular style for picture frames‘) . It is very much of its period in its imaginative interpretation of early 16th century style, but also a vivid demonstration of the idiosyncratic approach which the Victorian collector could adopt in the effort to present his Old Master paintings within his conception of an appropriate setting. 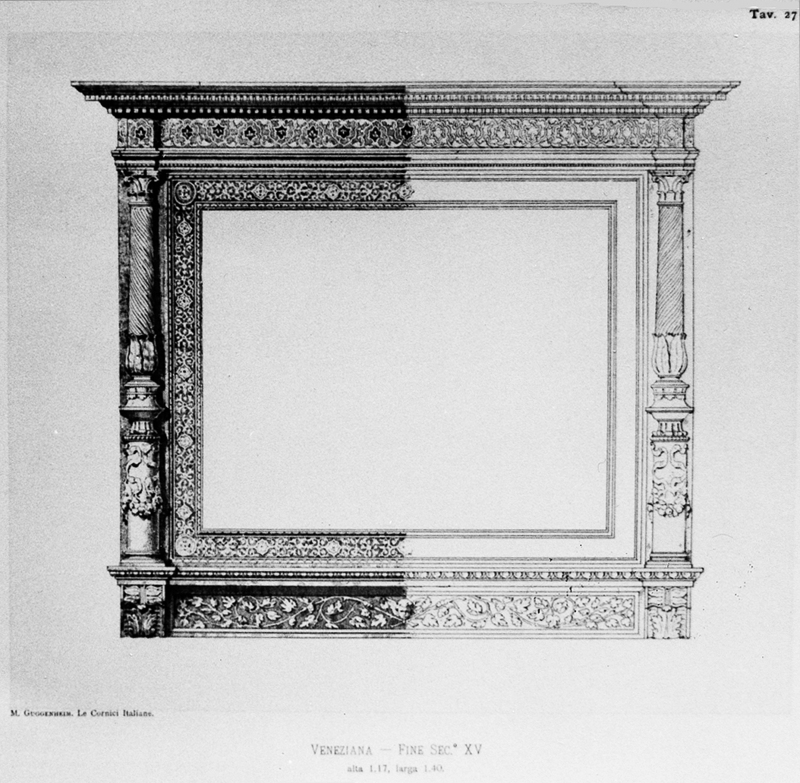 Nicolas Penny published further examples of work by Giusti and Barbetti in his 1998 article (also in The Burlington Magazine), ‘The study and imitation of old picture frames’, including a tabernacle in the V&A complete with curved pediment and scrolling apron (Pietro Giusti, 1862, top – painting purely for infill), and a finely carved cassetta by Angiolo Barbetti, made especially for Luini’s Madonna and Child with John the Baptist (lower image) . 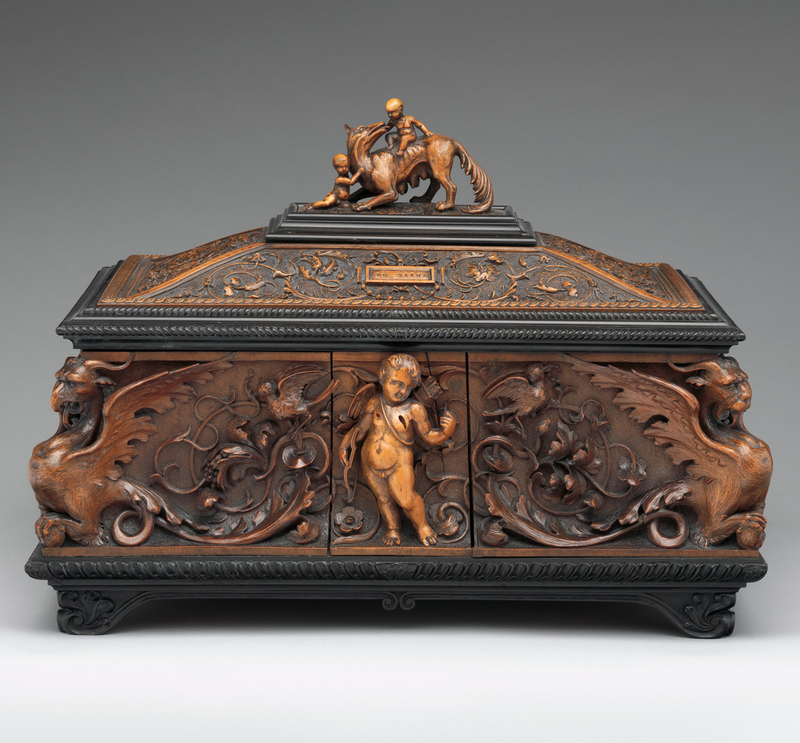 The V & A possesses other examples of Barbetti’s work – notably a console with an attached aedicular looking-glass above it, the inner frame of which is similar in treatment to the frame of the Luini. This console was, like the frame by Pietro Giusti, purchased from an international fair – in this case, from the 1851 Great Exhibition; together the two pieces illustrate perfectly the trend which Ralph Wornum had perceived in the latter event: the growing fashion for a weighty, opulent and fantastic vision of the 16th century interior, within which paintings of the period might be accommodated in a romanticized ‘historical’ fashion. The console and its frame present a very altarpiece-like appearance, transformed to the secular by a looking-glass, and made consistent with the mid-Victorian interior by a very dark polished finish. 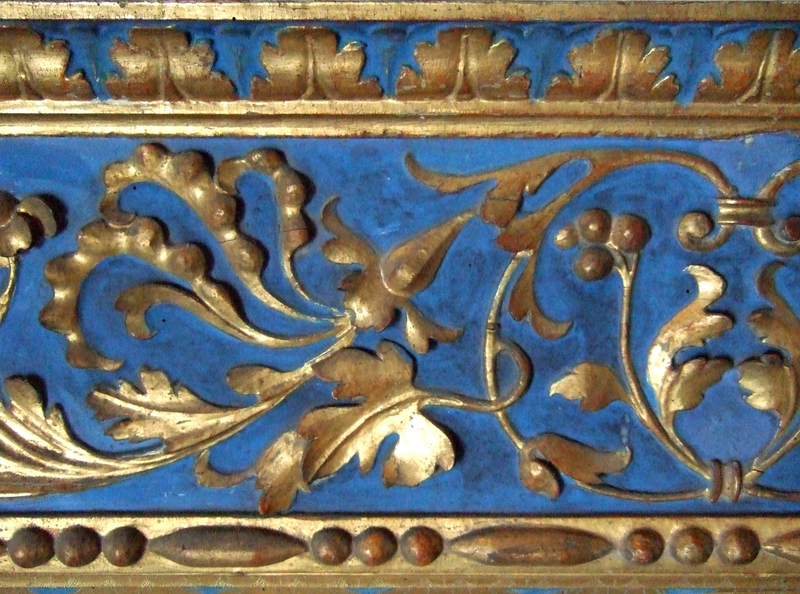 This last consideration may explain why there is an emphasis in both Barbetti’s and Giusti’s work on dark wood, rather than a gilded finish; and why their panels of shallow relief carving on frames are frequently of stained wood relieved on gilded grounds, rather than – as in the original 16th century frames – gilded against a gold or painted ground. 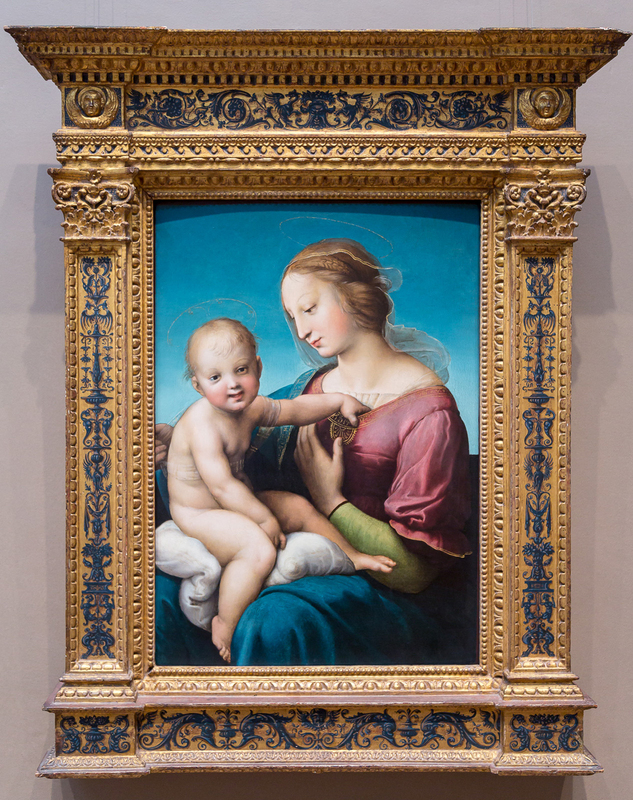 The style of their relief carving appears to be related to the highly refined carved ornament seen, for example, in the original contemporary frame made for Raphael’s St Cecelia, still in situ in the church of San Giovanni in Monte, Bologna, around a 19th century copy of the painting (the Raphael itself is now in the Pinacoteca Nazionale di Bologna in a replica of the frame). 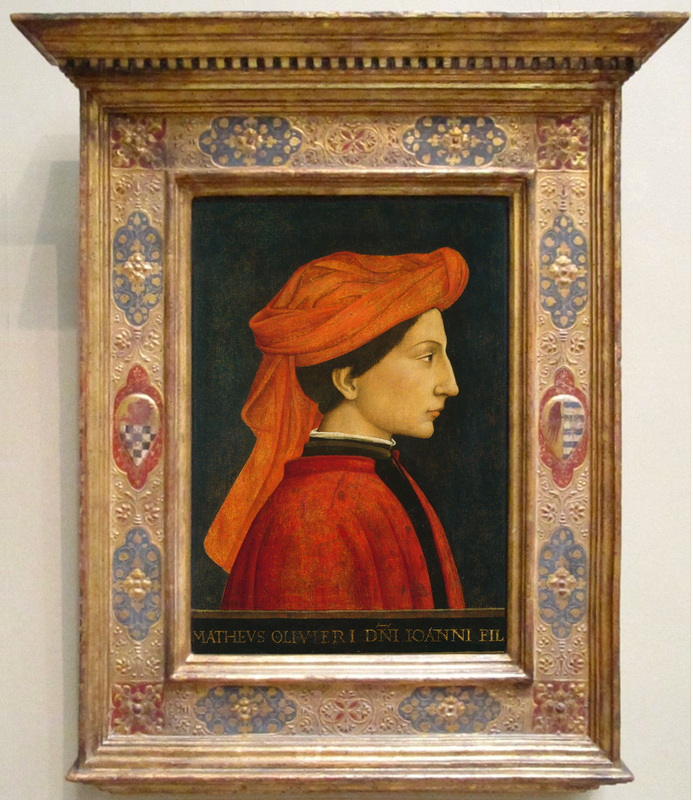 This frame has historically been attributed to Andrea Marchesi da Formigine, but more recently to the workshop of Giovanni Barili – but perhaps this should be his far less shadowy uncle, Antonio Barile (Siena, 1453-1517)? 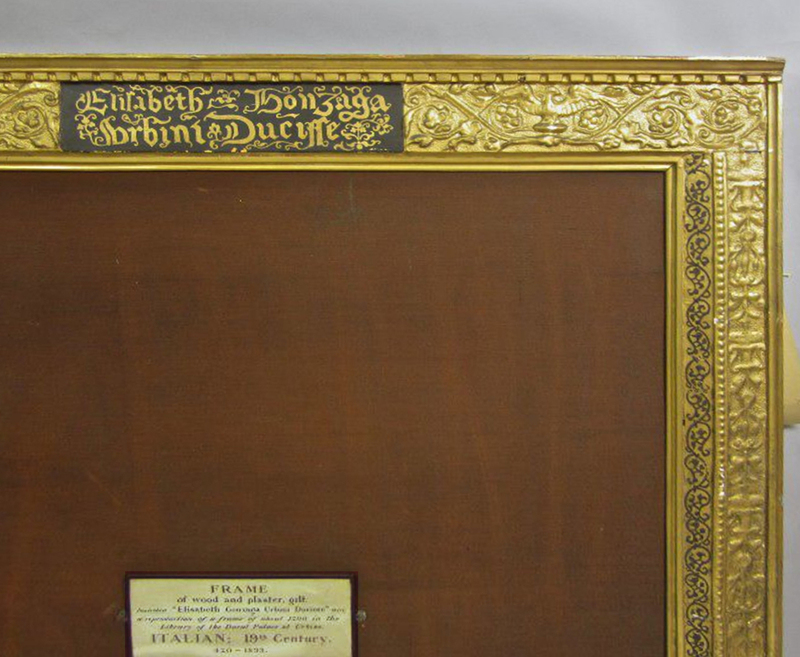 The work of both the 19th century framemakers is notable for the crispness and definition of the carving, and Penny remarks in a footnote that ‘Barbetti is known to have venerated the Barili’ . 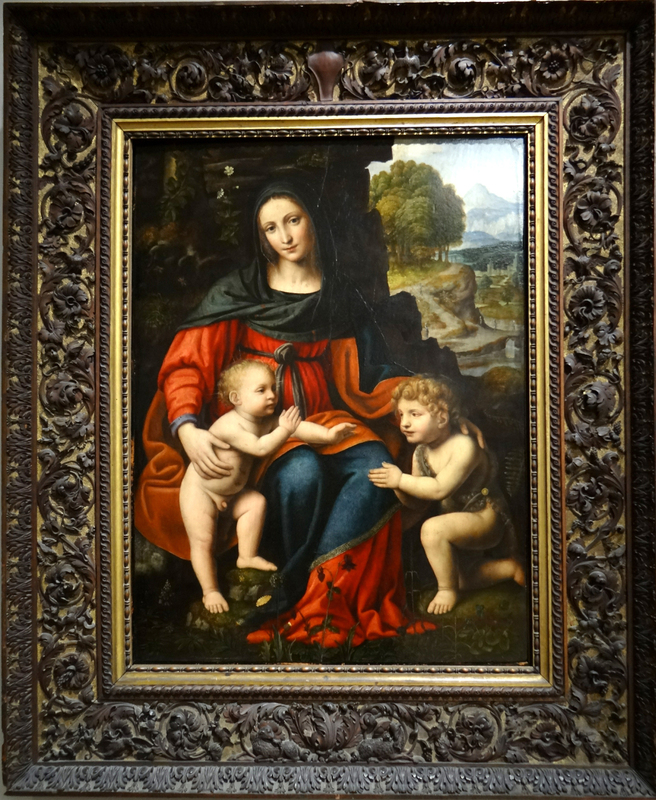 Other works by Andrea il Formigine must also have been models for these later carvers; the magnificent frame on Girolamo Siciolante da Sermoneta’s Madonna & Child with saints, which was commissioned, along with the paintings, by Matteo Malvezzi in 1548 for the church of San Martino, and the simpler frame (above; attributed to il Formigine) of Giacomo Francia’s Christ Pantocrator with St Michael & saints in San Domenico, both in Bologna. Including the St Cecelia, these three Bolognese altarpieces alone provide a rich library of running, vertebrate and repeated upright motifs, as well as carved decoration for architectural mouldings. 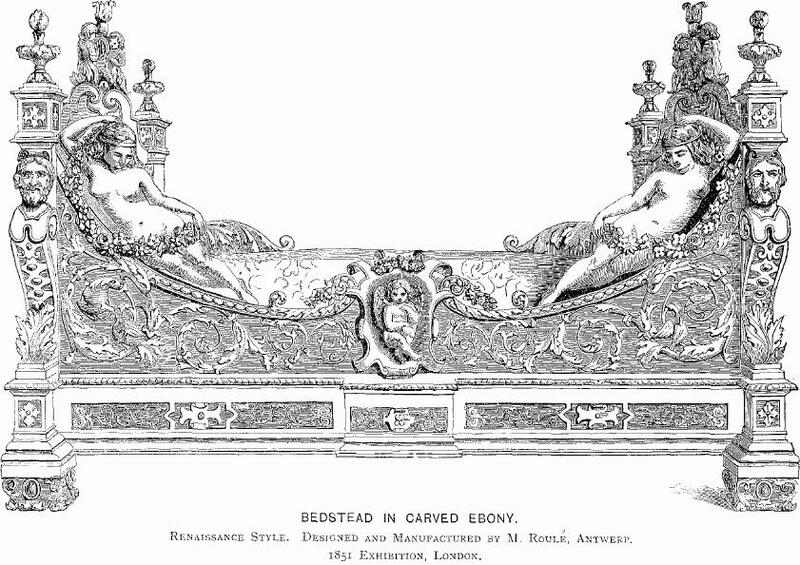 Similar combinations of refined and flowing foliate ornament, morphing into flowers, peapods, berries, grotesques, putti and birds, were also transmitted to craftsmen in a less direct way, through the publication in 1856 of Owen Jones’s The grammar of ornament. Jones had been one of the superintendents of the 1851 Exhibition, responsible for decorating the interior of the Crystal Palace, and arranging the exhibits in their respective rooms. The grammar…, his vast, innovative, colourful harvest of decorative motifs from various eras and cultures, included a chapter on Renaissance and one on ‘Italian’ ornament, and brought the vocabulary used by carvers such as Antonio Barile and Andrea il Formigine into the workshops of craftsmen across the world. It was an important work for the mid-century framemaker, and was followed just over forty years later, as Penny points out, by Michelangelo Guggenheim’s collection of a hundred-plus Italian Renaissance frames, beautifully photographed in black-&-white or engraved , which was a seminal publication for the next wave of revivalist craftsmen, including those who worked for Duveen. 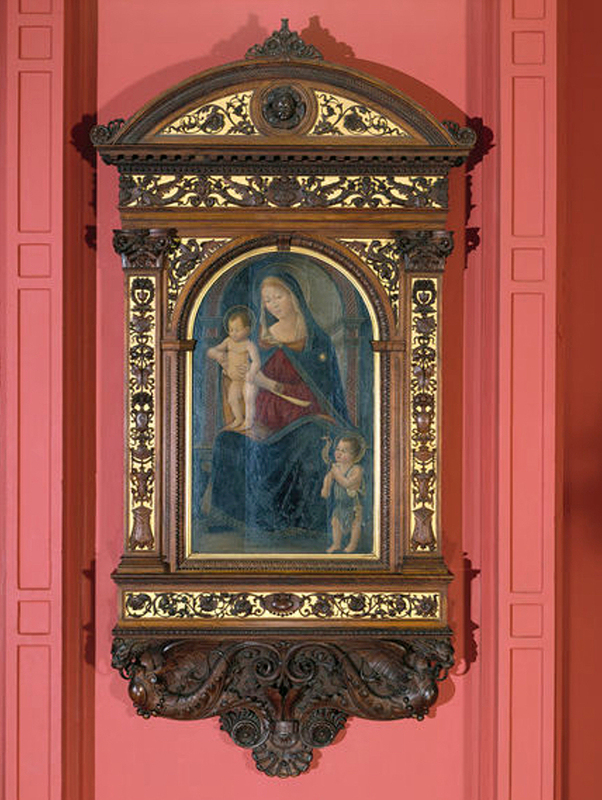 This can be seen in the aedicule (as it now is, above) made by Vannoni for the ‘Niccolini-Cowper Madonna‘ in 1928, which Karen Serres illustrates in its original form as a tabernacle, before the removal of its curved pediment and apron. 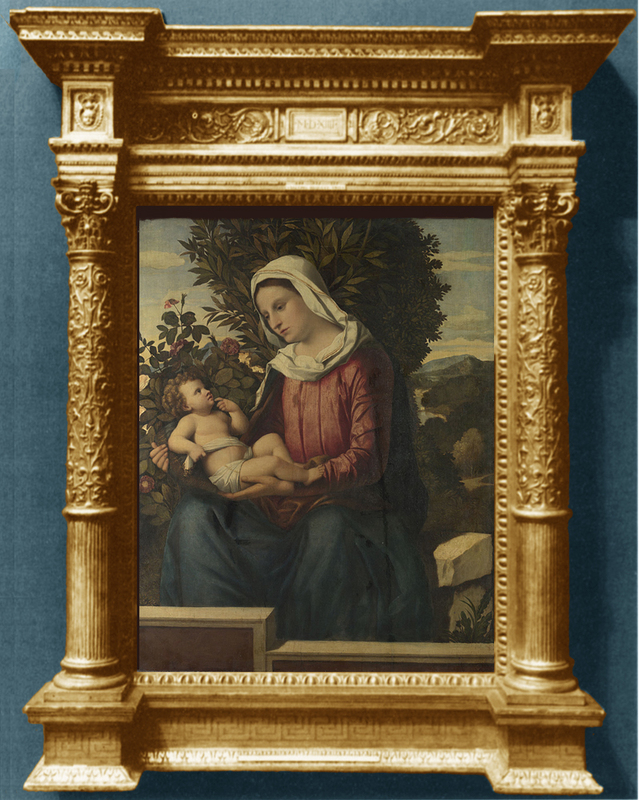 It is clearer still when this latter frame is compared with, for example, the 15th century frame designed by the designer, architect and sculptor, Giuliano da Sangallo, for the Ghirlandaio altarpiece in Santa Trinità. The truth is that every age thinks its own reproductions of antique objects to be indistinguishable from the real McCoy, only for Time to reveal the elements of pastiche which it itself exaggerates in small differences of technique – just as when we look back at films set in previous eras, they can easily be dated to the decades when they were made. 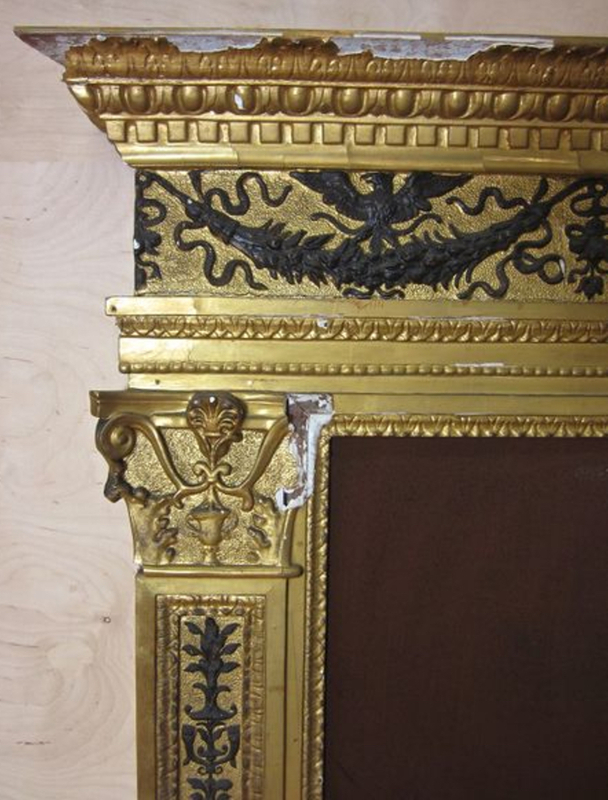 The interest in these revival Renaissance frames lies in the specific decades which produced them, and in the vision each period had of the 15th and 16th centuries at it looked back to them. The versions of Renaissance design, ornament and architecture which were produced during the last two centuries carry a lot of information about the attitudes behind their design, and about the increasing need for research and bids for greater accuracy which fuelled them. 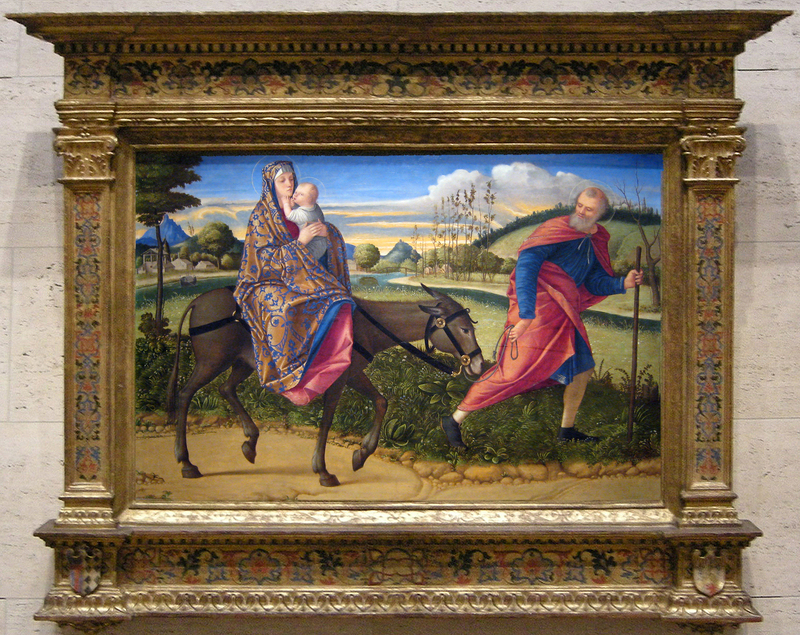 The V & A, for instance, as well as examples of work by Pietro Giusti and Angiolo Barbetti, possesses two frames which were reportedly copied in the second half of the 19th century by a Signor Gualdesi of Urbino from frames in the Palazzo Ducale there, and finished by Giosué Lumaconi of Perugia, from whom they were purchased. Both are decorated with moulded ornament, and, while the inscription on the lower frame is peculiarly unconvincing, they seem to be in the nature of NeoRenaissance props, or records which teach and inform – functioning rather like the replica sculptures in the Cast Court of the V & A. 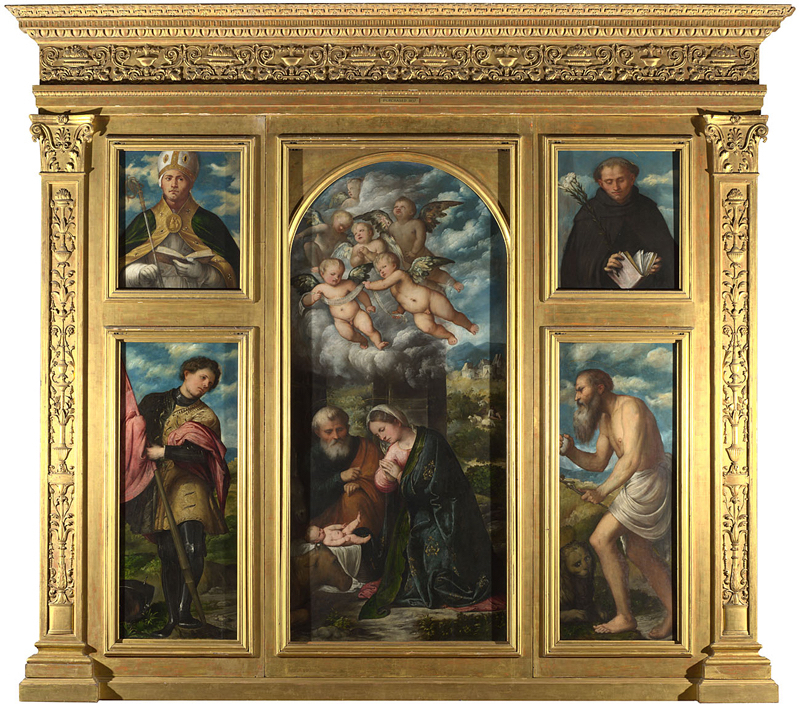 On the other hand, the National Gallery owns an altarpiece frame by ‘Signor Spelluzzi of Milan’ which was commissioned for Romanino’s polyptych from San Alessandro, Brescia, and is purely 19th century in its Renaissance revivalism. 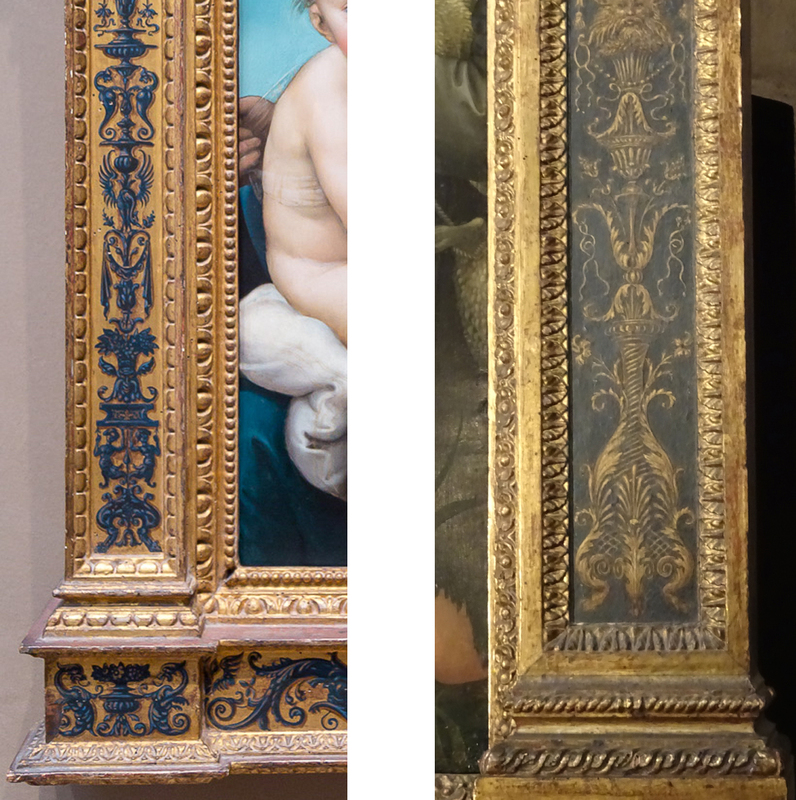 The proportions and the plain panels around the inset openings for the paintings are particularly curious, and it bears more relationship to the frames used by the Victorian ‘Olympians’ (Frederic, Lord Leighton; Edward Poynter; Alma Tadema; Edwin Long; Burne-Jones) than it does to a 15th-16th century Italian aedicular frame. 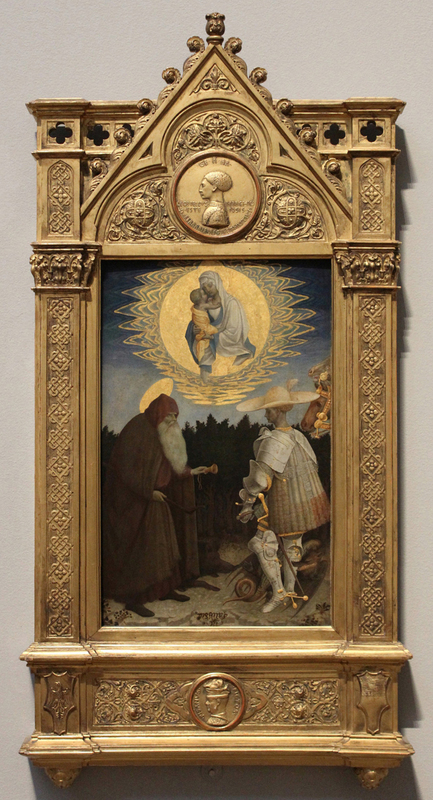 Also in the National Gallery is Pisanello’s Virgin and Child with saints, in a frame containing imitations of medals designed by Pisanello. This is a rather extraordinary amalgam of Renaissance and Gothic idiom, designed by Sir Charles Eastlake, director of the Gallery from 1855-65. The so-called ‘Demidoff Altarpiece‘ by Carlo Crivelli (1476) likewise belongs to the National Gallery; it is set in an anachronistically Gothicizing frame made for it in Florence in the 1850s, which was adjusted after its purchase in 1868. 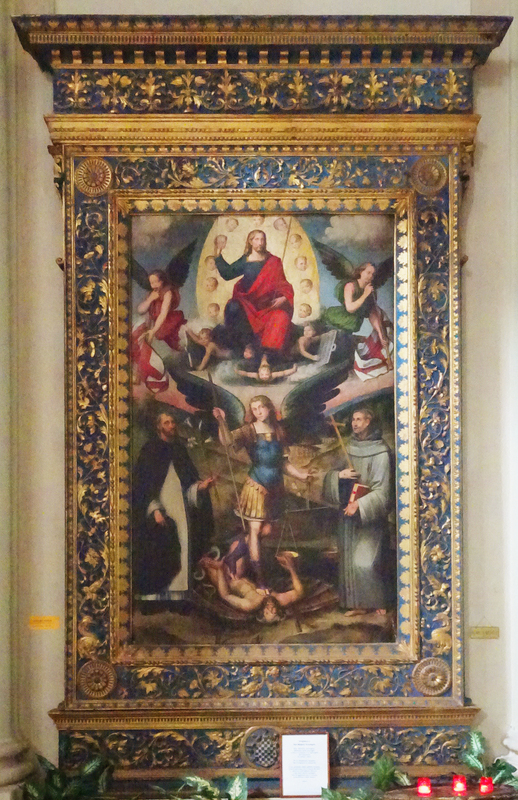 At that point its constituent parts were separated into the two altarpieces they had originally been parts of – they had been assembled into one polyptych and reframed for Prince Anatole Demidoff as part of his large art collection, housed in the 19th century Villa San Donato which had been built for his father just outside Florence. With Karen Serres’s latest article, we now know a great deal more than we did about Vannoni; the shadowy craftsmen of 19th and 20th century Italy are gradually being brought out into the light, revealing the continuing strength of the carving and gilding tradition – in Florence, particularly, but also in other centres; revealing too the changing conceptions of the Renaissance from the early 1800s to the 1940s and 1950s. Perhaps we shall soon know more about Vincenzo Bolci, Signor Spelluzzi of Milan, Signor Gualdesi of Urbino and Giosué Lumaconi of Perugia. N. Penny & K. Serres, ‘Duveen & the decorators’, The Burlington Magazine, 149, 2007, pp. 400-06, and ‘Duveen’s French frames for British pictures’, The Burlington Magazine, 151, 2009, pp. 388-94. Noted in Edward Joy, English furniture 1800-51, p. 153; quoted from R.N. Wornum, ‘The Exhibition as a lesson in taste’, The Crystal Palace Exhibition: illustrated catalogue, London, 1851; republished in facsimile by Dover, 1970. See also Rosanna Pavoni (ed. 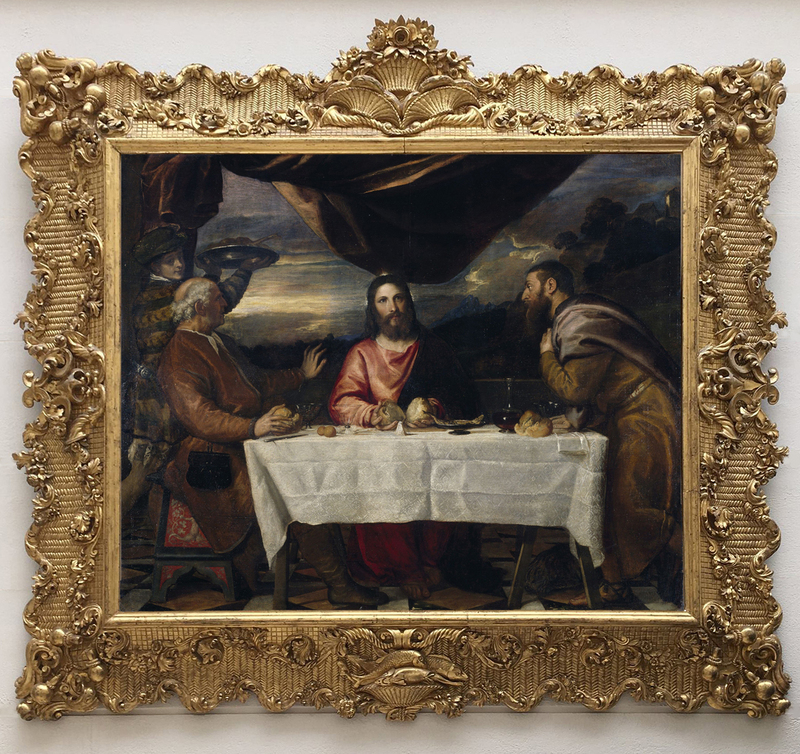 ), Reviving the Renaissance: the use & abuse of the past in 19th century Italian art & decoration, 1997. The archives are held in the Getty Research Institute, Los Angeles, and are also being digitized. The drawings belong respectively to The Sterling & Francine Clark Art Institute, and the collection of Massimiliano Sernissi. Nicholas Penny, ‘The study and imitation of old picture frames’, The Burlington Magazine, CXL, 1998, pp. 377. Ibid., p.375; M. Guggenheim, Le cornici italiane, 1897, Milan.